Annabelle Weiss dropped out of Hunter College in 1943 because she wanted to enlist in the armed services. With her parents’ consent, she joined the U.S. Marines and reported for training at Camp Lejeune, North Carolina, in April 1944. There she learned to “march, march, march” and was assigned to inspect airplane engines. Weiss was later assigned to Marine Corps Air Station Cherry Point, North Carolina. She served in the transportation unit, where her tasks included chauffeuring the base’s commanding officer. She was discharged in 1946. Susman discussed the project during her keynote address March 3 at the Day of FiTs conference (FiTS stands for Filling in the Spaces) at the School of Information Studies (iSchool). The Library and Information Science Student Assembly organized the annual event, which featured topics of interest to LIS graduate students that are outside the regular curriculum. Workshops addressed issues including professional resumes vs. CVs, nature programming for libraries and LGBTQ representation in middle grade and young adult literature. 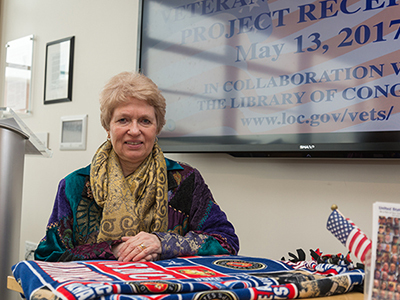 Susman started the project after realizing the busy library where she had worked for 20 years offered no specific outreach for local veterans. She described how the project works, saying that other library staffs can replicate it easily and inexpensively. She advertises and invites veterans to participate, then records interviews with them and creates a DVD. She uploads the interviews to the library’s YouTube channel, which patrons can access via the library’s website. The library also holds an annual reception for the year’s interviewees, and each veteran receives a DVD. Some interviews happen after Susman spots someone wearing a hat with military insignia and tells them about the program. Others hear about it and call to learn more. She understands that some veterans will be sharing painful memories. “I tell them if there’s anything they don’t want to talk about or don’t remember, that’s fine,” she says. “Some say ‘I have nothing to say’ or ‘I didn’t do anything interesting,’” Susman adds. But she disagrees, calling the vets “wonderful people with amazing stories.” The oral histories of veterans of World War II, the Korean and Vietnam wars, the conflicts in Afghanistan and Iraq and military service during peacetime preserve important memories for families and historians, she says. After Susman’s program was underway, she learned the Library of Congress had started the Veterans History Project (VHP) in 2000. The national project collects interviews, correspondence and memorabilia from veterans and their families. Susman applied some VHP procedures to her project and sends the Library of Congress copies of the DVDs she produces. Susman grew up in Syracuse and earned a degree in music from the University of Indiana. She still plays and teaches flute. She credits a neighbor, longtime iSchool professor Marta L. Dosa, with encouraging her to enroll in the School of Information Studies. Pauline Atherton Cochrane, another longtime iSchool professor, also served as a mentor. “Without them, my life would have been very different,” she says. After completing her master’s degree, she sought jobs as a music librarian. Cochrane tipped her off to a three-month position at the Library of Congress, “a dream job” in Washington, D.C. Susman spent five years teaching congressional and library staff to search the Library of Congress system.